I’m hooked. 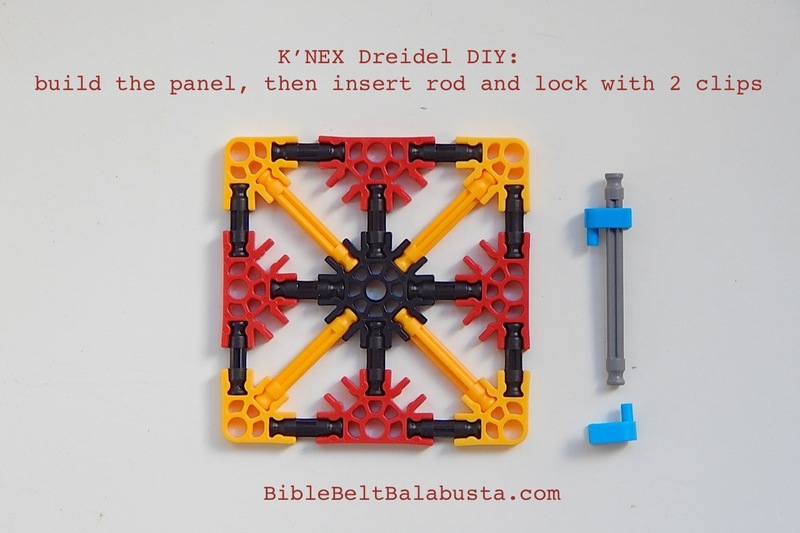 I’m not even a K’NEX fan, but it turns out that a K’NEX dreidel is absolutely irresistible to build and to play with. These dreidels spin like mad, are easy to assemble and don’t fling themselves to bits, even when doing battle in a dreidel arena. Imagine students building these at a Hanukkah Carnival . . . 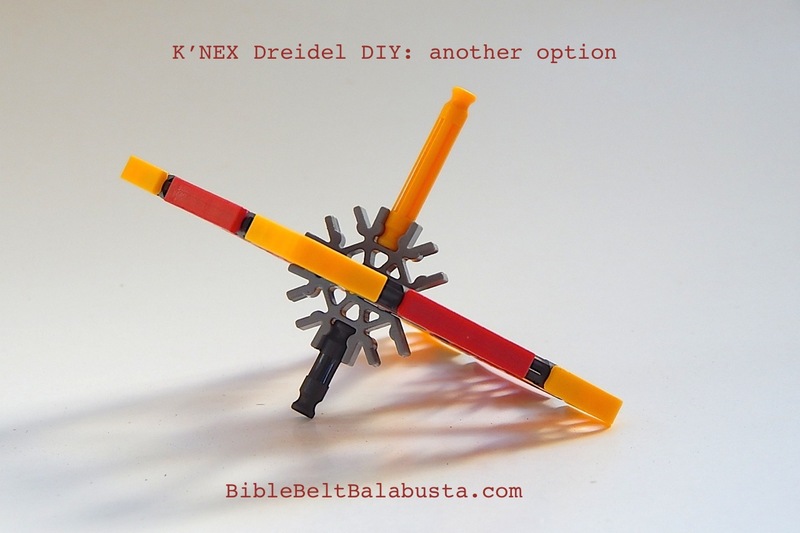 I don’t see anything about a DIY K’NEX dreidel online, but there are a few “tops” here and there. 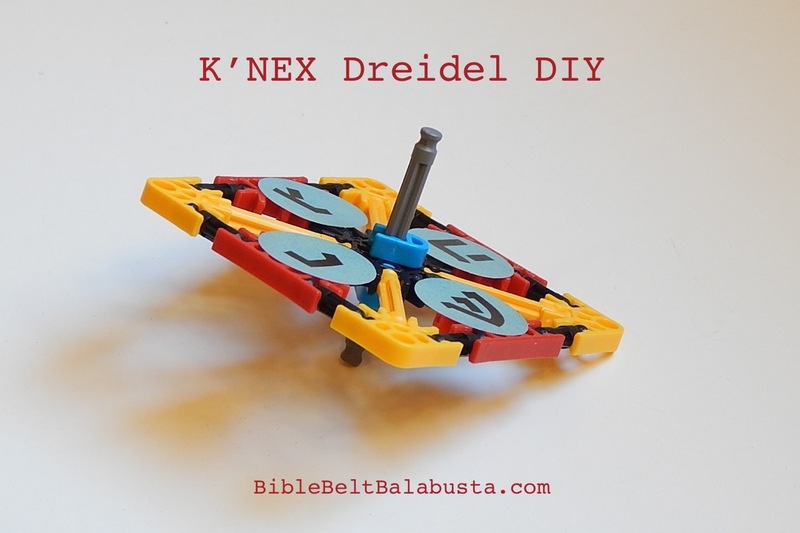 So, to remedy another Internet oversight, here’s my simple K’NEX Dreidel: just a four-sided top with kavanah / intention. Even young kids can put it together just by looking at the photo below. I hope it will inspire builders to come up with different models, testing for balance, stability, speed, endurance and whatnot. NOTE: I am a LEGO fan and feel sheepish about touting K’NEX. 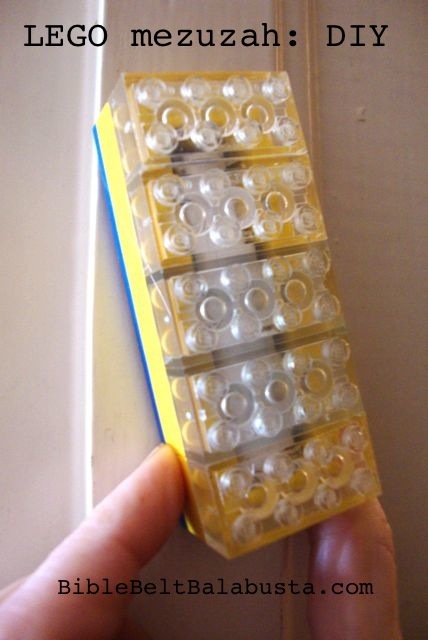 See my printable how-to for simple LEGO dreidels, which is also perfect for parties, classrooms and carnival stations. K’NEX “happens” in two different scales: Classic (big) and the newer Micro (small). I use the Micro size for this model. Micro is so much easier, especially if you are a little kid or a ham-fisted college professor (my two testers at home). Micro pieces snap together easier and are far less likely to pinch fingers mid-snap. But, the part shapes are identical in both sizes—same shapes but different color scheme—so if you’ve already got the Classic K’NEX at home, just eyeball the shapes and match the parts. I’m all about using what you already have. That’s what I just did. 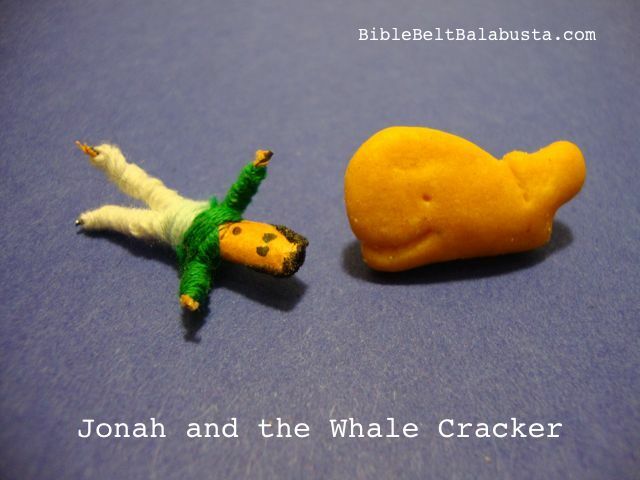 I’ll be making these with 2nd and 3rd graders. All we have to add are the LETTERS on a dreidel (see below). Assemble panel as per photo below. Insert yellow rod in center. Lock rod on top of dreidel with blue pin. 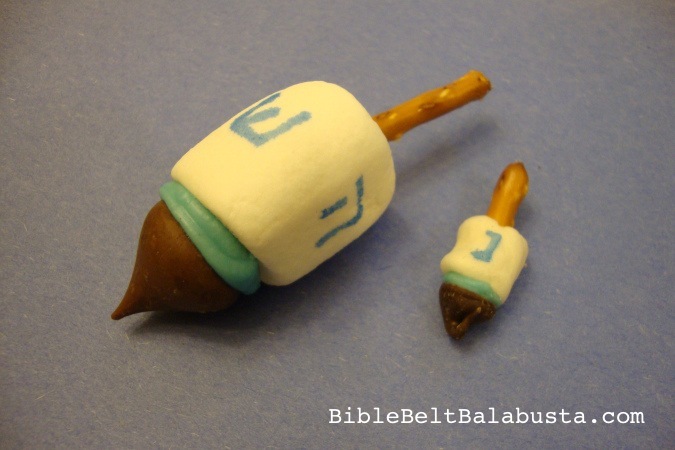 Lock rod on bottom of dreidel with blue pin. Experiment with length of rod below the panel to find the center of gravity and weight distribution for best spin. One pin on top, one pin under. Locked and loaded. 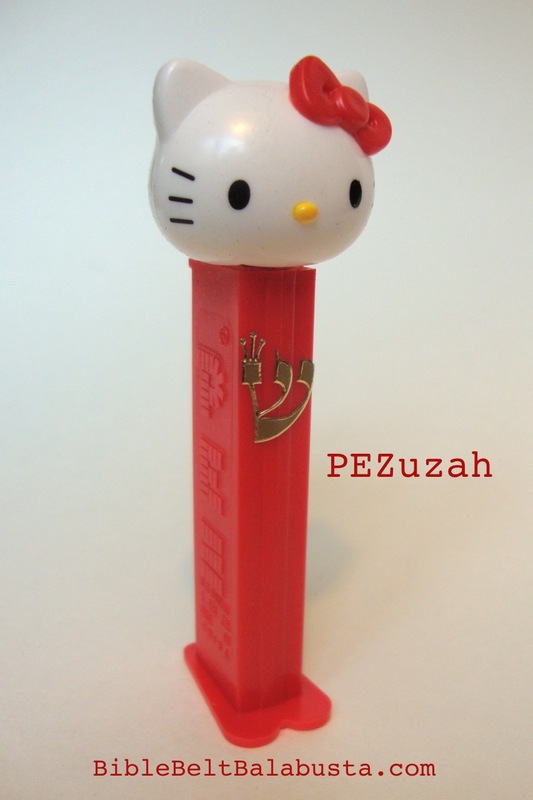 I’ll supply my students with 1/2″ colored Avery round labels, upon which they will have to write the correct Hebrew letter: nun, gimmel, hey, and shin. Then, they will apply the stickers to the dreidel top in the correct order (right to left). A kid who has to write the letters and stick them on in the right order is a kid who will be more likely to remember the letters and what they stand for: Nes gadol haya sham / A great miracle happened there. 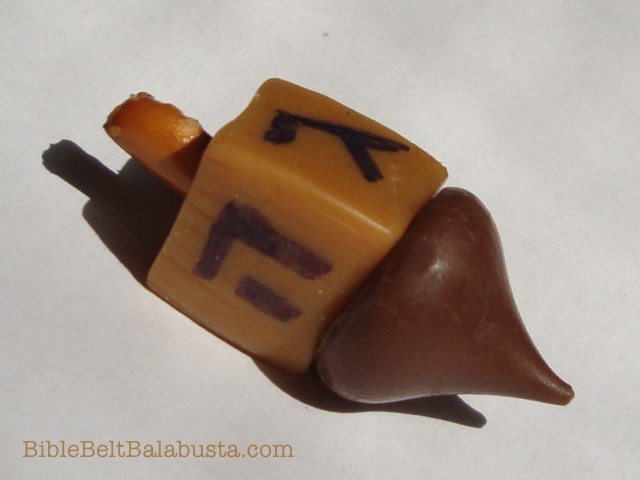 If you are bringing dreidels to a nonJewish school for a show and tell, see this article for suggestions, checklists and printables: “Hanukkah Parent” School Visits. 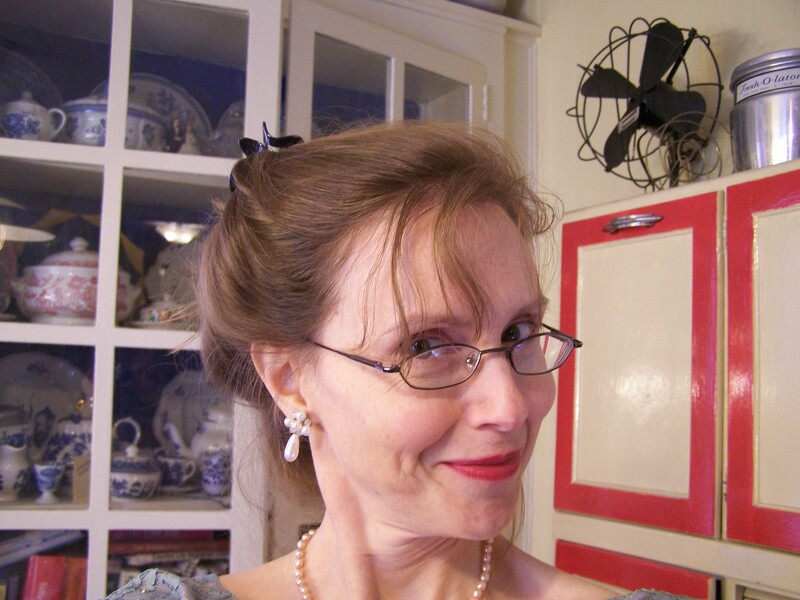 This entry was posted in Activity, Crafts, Hanukkah, Jewish Toys and tagged dreidel, K'NEX. Bookmark the permalink.